https://cdn2.hubspot.net/hubfs/644585/Tradeshow_Pictures/amp%202017.jpg We showed the benefits of an integrated review of CNV, AOH, and SNV using our NxClinical software which handles both array and NGS data in a single system. Welcome back to every one who visited us at AMP 2017 in Salt Lake City, Utah! Hope you enjoyed the great networking events, beautiful city center, and of course, our ever popular BioDiscovery “SNP HAPPENS!” T-shirts! We highlighted our new algorithm for copy number estimation from whole exome sequencing data in tumor samples at our poster. The poster showed results from our BAM (multiscale reference) algorithm in Nexus Copy Number for CNV estimation from WES in prostate cancer samples use selected tumor samples as a reference. ; the results were comparable to that from SNP array. 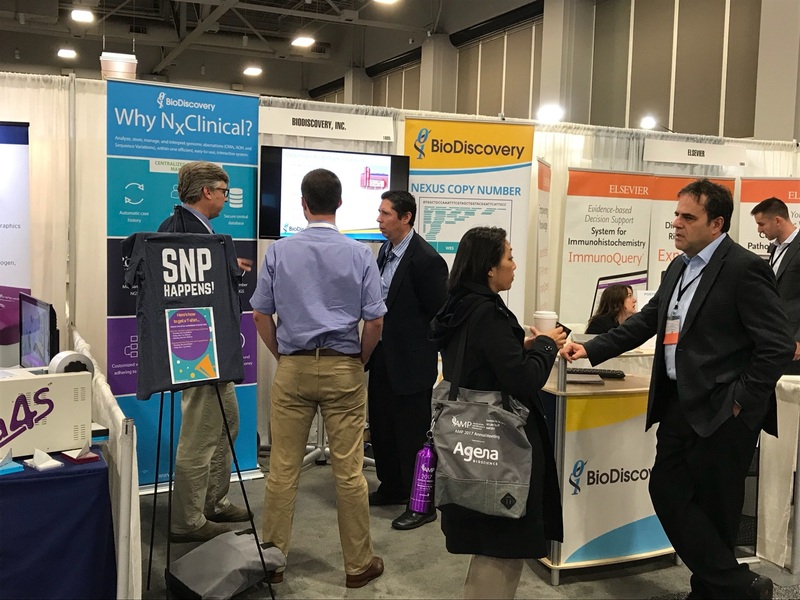 At our in-booth demos, we showed the benefits of integrated review of CNV, AOH, and Sequence Variants using our NxClinical software system which handles both array and NGS data in a single database system. This not only provides the most comprehensive interpretation but also consolidates use of multiple tools into one tool saving time and money. Looking forward to seeing everyone again at AMP 2018 in sunny San Antonio, Texas.